What’s the sum of the first 100 counting numbers? Where does the sum of the powers of ½ converge to? 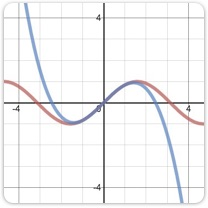 How can you visualize the Taylor series expansion for sine? Answer these questions (and more!) with summation in Desmos. Get started with the video on the right, then dive deeper with the resources and challenges below. For more information about summation, check out this support article.